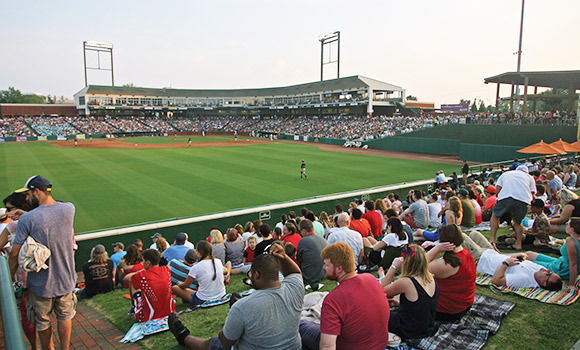 UNCG is bringing its 125th anniversary celebration to First National Bank Field this weekend for a special Fan Appreciation Night with the Greensboro Grasshoppers. Join fellow UNCG Spartans on Saturday, Aug. 19, at 7 p.m. as the Grasshoppers take on the Hickory Crawdads. Throughout the night, fans will enjoy entertainment from UNCG’s spirit teams and “Band of Sparta” pep band, free giveaways and fireworks. UNCG Chancellor Franklin D. Gilliam, Jr. will announce the starting lineups and lead the crowd in the singing of “Take Me Out to the Ball Game,” and UNCG Head Basketball Coach Wes Miller will throw out the first pitch. Students, faculty, staff and alumni can purchase discounted tickets online or at the stadium using the following purchasing code: UNCG125. In addition, a limited number of free student tickets will be available Saturday afternoon during the HRL Carnival on campus. Transportation will be provided to and from the game. Shuttles will run from 6:15 p.m. until 30 minutes after the conclusion of the game. Campus pick-up location will be in front of Elliott University Center.